Add smokiness to your pork ribs with flavored wood chips. With so many different types of wood chips on the market -- apple, cherry and maple wood -- it can be hard to decide which one is the best for smoked pork ribs. Pork ribs suit strong flavors, so wood chips with potent aromas will work well. The smoke will penetrate the ribs, giving them a smoky flavor. You either can sprinkle the wood chips over the coals, or on an electric grill, placed within a smoker box. Hickory is a type of hard, tough wood that grows predominantly in North America. The wood from these trees is used to make wood chips for the barbecue; they give meat a strong smoky flavor and are particularly suited to pork ribs. Oak wood chips, as the name suggests, come from the oak tree. It is a strong, hard wood that is high in tannins, which is why oak barrels are used to age wine and whiskey. The wood chips impart a smoky, characteristic woody aroma that flavors ribs. Mesquite trees grow primarily in northern Mexico, and the wood they produce is used to make furniture. Mesquite has a strong, earthy fragrance; it is recommended to use these wood chips sparingly, as a little goes a long way. Too much mesquite can make food bitter. Soak wood chips in water for 15 to 30 minutes before using, since this prevents them from burning too quickly. Let them drip dry before adding to the barbecue; otherwise, they may put the fire out. 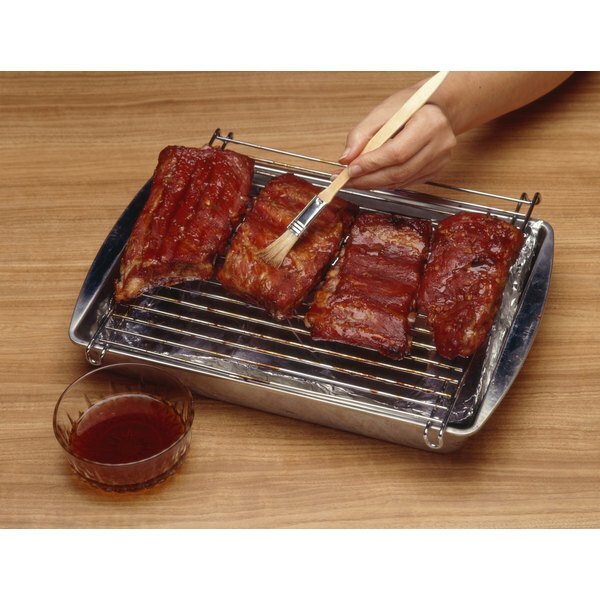 If you’re grilling the ribs or placing them in a smoker for only a short period, then you don’t need to soak the wood first. What Kind of Beer Is Good to Marinate Beef Ribs?